Creek setbacks are generally acknowledged to be essential if creeks are to retain any of their natural functions in a developed area. These include: serving as a wildlife corridor; providing habitat for fish, including the threatened steelhead; allowing for lateral movement; filtering out pollutants by means of riparian vegetation on a sloping creek bank; and conveying flood waters. A natural creek also has an esthetic value and cooling effect readily recognized by any homeowner living by a creek. Regardless of their value, our creeks and their environs continue to be degraded by structures and paving that are constructed too close to the channel, and by the armoring of creek banks to protect these structures. Armored banks lead to narrower channels, faster flowing flood-waters, additional erosion of creek banks both upstream and downstream, and further armoring. Destruction of native vegetation and water diversions also degrade the riparian corridor. All this destroys the very things we value about our creeks – and may result in bringing about what San Anselmo and Fairfax prevented the Army Corps from achieving in the 1970s: the substantial channelization of San Anselmo, Fairfax, and Sleepy Hollow creeks. Effective protection measures should be incorporated in city and county codes to cover alterations within the creek channels and improvements on property adjacent to the creeks. An ordinance would have to be flexible enough to fit the varied conditions of lots within the town, while not allowing so many exceptions that it is ineffectual. ordinances to control development on properties in the vicinity of our creeks, and to ensure that when development occurs, riparian habitat is simultaneously improved. Natural features and functions of a creek corridor should be protected. These include: sloping banks; native vegetation; a riparian zone capable of filtering out pollutants (especially sediment); wildlife habitat and passage; aquatic life; a degree of meandering of the stream; esthetic value; bank cover to reduce erosion; and roughness of banks to attenuate flood waters. A “creek” means a watercourse (a) that carries water from either a permanent or natural source, either intermittently or continuously, in a defined channel, continuous swale or depression, or in a culvert that was placed in the general historic location thereof; and (b) the water either merges with a larger watercourse or body of water, or is diverted into an engineered structure that does not follow the general historic course of a creek. A “creek” does not include any part of an engineered structure developed for collection of storm or floodwaters (e.g. a storm drainpipe) that does not follow the general historic course of a creek. A “permanent or natural source” includes a spring, artesian well, lake, estuary, or a rainfall drainage area that covers at least one-third acre (14,520 square feet). The word “creek” is used synonymously with the phrase “natural watercourse” in this chapter. A “swale” is a shallow trough-like depression that carries waters mainly during rainfalls and snowmelts. The City of Berkeley may maintain maps and other reliable records, reflecting such creeks for the guidance of the public. 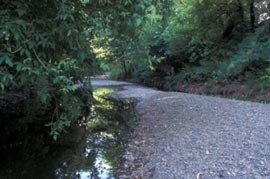 Designated creek corridor width should be based on the potential for riparian habitat, and varies from creek to creek. Some definitions of creek corridor width depend on the observed creek profile and character of existing vegetation at a particular site. However, in a developed area, such a definition ignores prior destruction of riparian vegetation and the natural potential of an area. The designated creek corridor is narrower than the setback, and within it property owners are encouraged to enhance riparian habitat. Creek setback. Setbacks are generally measured from the top of the bank or from the creek centerline. The City of Oakland defines the setback as being measured back from the imaginary top of a 2:1 slope from the toe of the bank (i.e., a 26-1/2 degree slope), a definition that more closely approximates a natural condition in alluvial soils. Such a definition also avoids depending on a movable and often artificial starting point; additionally, homeowners who grade back the creek bank could find themselves penalized as the effective setback becomes actually increased. The setback distance could vary from creek to creek, as established in a management plan. Development (e.g., buildings, impervious paving, swimming pools) should be prohibited within the setback. Varying setbacks could be established for different reaches of a creek depending upon the width of the riparian corridor, and potential (or lack of potential) for creek restoration. 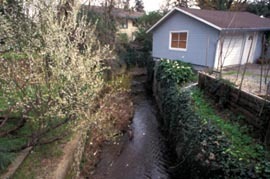 The term “buffer” may be used to refer to a band of lightly-used land between a defined creek corridor and the setback distance. Uses that are allowed or disallowed within a designated zone must be defined. Improvements such as fences, paving, decks, hot tubs and ornamental plantings must be addressed. Design review should be required in defined circumstances. Variances may be permitted on improved properties, on small lots, and in irremediable situations; however, most situations should be addressed through the specific setback distance established for each creek. The requirement to obtain permits from other regulatory agencies should be included. These agencies may include Regional Water Quality Control Board, California Department of Fish and Game, Army Corps of Engineers, NOAA Fisheries, and the Coastal Commission. Any new creekside project should include a survey of the riparian area and a study of the consequences of any alterations to grade, vegetation or runoff. Habitat enhancement should be encouraged or required as a condition of a permit. New vegetation should be maintained and monitored. Tree protection policies should consider whether a species is native or not. Invasive non-native plant species such as bamboo, giant reed (Arundo), ivy and periwinkle (Vinca) should be prohibited from being planted within protected zones. Only native riparian species should be planted within the designated riparian corridor. Fence design should be considered, to allow for wildlife passage and creek protection. Surface runoff must be managed to increase infiltration and reduce erosion. Best Management Practices for creekside construction should be defined. Biotechnical techniques of bank stabilization should be required, when stabilization is necessary. Any other technique used must incorporate plantings, e.g., crib walls and riprap. Ideally, the bank is sloped back to a gentler grade. Channel water-carrying capacity should be maintained. Flood-plains should be enlarged where possible. Vegetation removal and trimming for flood control purposes must be carried out only as each specific site requires to serve the purpose, following up-to-date practices. Water diversions should be prohibited. Summer pools are critical habitat for young steelhead. Marin County Stormwater Pollution Protection Program (MCSTOPPP). Regional Water Quality Control Board. Center for Watershed Protection (www.cwp.org) in Maryland, can provide some guidelines for urban areas. County of Marin: Stream Conservation Area for the City Centered Corridor (draft 2003). Novato: Waterway and Riparian Protection. Oakland: Creek Protection, Stormwater Management and Discharge Control Ordinance.